The final Enduro for the year will be at the beautiful venue Val du Charron in Wellington. Stage information will be released at a later stage, looking at 4 or 5 stages for the day. E bikes are welcome to join, remember there needs to be more than 10 E bikes to qualify for podium. You will pass the waterpoint multiple times stocked with water, Powerade, Coke, jellies, fruit, Redbull. Return your number board to us afterwards and we will give you a free beer (or Powerade / Redbull). Piza e vino will be ready with your morning coffee and now serve breakfast too and that delicious pizza for afterwards. The setting for this venue is spectacular. R400 for non-members and R375 for Amarider members for one day. Please note that ONLY pre-entries will be accepted! Includes permit & refreshment station. Kids under 18 pay R230 only for pre-entrants! SUPPORT: Waterpoint with Coke, fruit, Powerade, Red Bull, jellies etc will be placed at a strategic point to assist with rider support. The beauty of the format is that you can relax a bit at this station and catch your breath before tagging into the next Special Stage. Have you done an Enduro event? Then you know what it is about! If not, then here is a summary: riders get timed only on certain sections, which make a very social event, especially at the refreshment station where they re-group. The atmosphere is relaxed with no rush anywhere, except when you gun it between check points! Must own an Amarider Trail Tag. R100 or take a yearly Amarider membership of R225 and a Tag is included! Watch out for the TAG POINTS at the beginning & end of each stage. 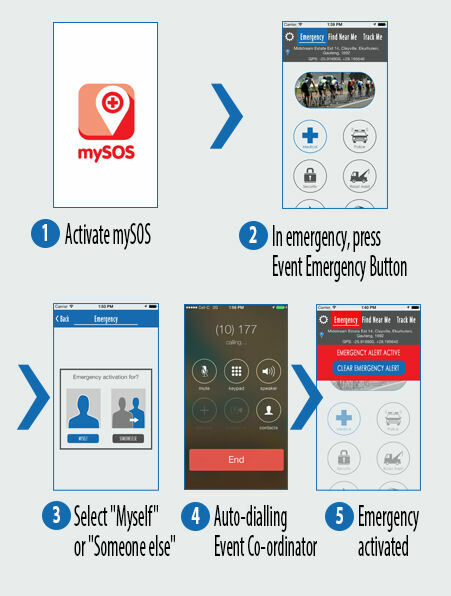 mySOS app is a Smartphone app available for both iOS and Android. (d) auto-notifies the events emergency coordinator on your behalf and provides them with the necessary information. We encourage all participants to carry their phones with them during the event, arm pouches or a camelback will be perfect for this! Can also be purchased at our Trail Centre. The first event was held at Dirtopia MTB Festival, Greyton in December’12 and proved to be a lot of fun. We’d like to bring you more of this great riding and improve the system in the process. Waterpoint with fruit etc will be placed at a strategic point (Pepper Tree) to assist with rider support. The beauty of the format is that you can relax a bit at this station and catch your breath before tagging into the next Special Stage. 2. Wear the tag around your right wrist like a watch. Not around your ankle please. 3. The reader is powerful enough to read through arm warmers etc.